Part I. An Abrupt Introduction to Spanish Influenza: 1. The great shadow; Part II. Spanish Influenza: The First Wave - Spring and Summer, 1918: 2. The advance of the influenza virus; 3. Three explosions - Africa, Europe, and America; Part III. The Second and Third Waves: 4. The United States begins to take note; 5. Spanish Influenza sweeps the country; 6. Flu in Philadelphia; 7. Flu in San Francisco; 8. Flu at sea on voyage to France; 9. Flu and the American expeditionary force; 10. Flu and the Paris Peace Conference; Part IV. Measurements, Research, Conclusions, and Confusions: 11. Statistics, definitions, and speculations; 12. Samoa and Alaska; 13. Research, frustration, and the isolation of the virus; 14. 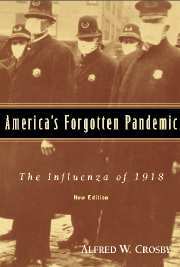 Where did the flu of 1918 go? ; Part V. Afterword: 15. An inquiry in the peculiarities of human memory.